Volume 14 | Qioptiq: "Focussing on Integration to Increase Capability"
With a number of potentially revolutionary capabilities emerging as key enabling technologies make their way up the Technology Readiness Level (TRL) ladder, the roadmap for integrated Surveillance, Target Acquisition and Engagement is becoming increasingly interesting. The scene is firmly set for the 2015 – 2020 period where we will see significant enhancements in sighting system capability through technology evolution and deeper integration with weapon and soldier systems. However financial constraints in any industry means time and money allocated for product design and development comes under pressure, non-more so than in the defence sector at this time. Qioptiq recognises that new product development is vital to the organisation in order to ensure that we are able to offer our customers the highest levels of capability in order to ensure mission success and equipment needs to be developed and deployed within very short timeframes. Qioptiq continues to push the boundaries of Weapon Sights & Surveillance Equipment for DCC users with some significant product and technology development activity in 2014. Qioptiq is known for its extensive design and production capabilities, research and development and its leading-edge innovation, we also benefit from strong technology development teams and strong customer relationships. Qioptiq is supporting a number of opportunities where high performance, ITAR free equipment is required. This has demonstrated that our hard work in both product development and strengthening the integration between Qioptiq and other stakeholder organisations has paid off. We have strengthened the international links within our own Defence & Aerospace Division (DAD) and with that of Excelitas (Qioptiq, an Excelitas Technologies Company) in order to provide a better service to our customers around the world. We have also continued to strengthen our research & development capacity and are undertaking some interesting work packages looking at Digital Optical Weapon Sights (DOWS), Augmented Weapon Sights and Integrated Power & Data connectivity with weapon systems. We will be releasing some new demonstrators and products at this year’s Soldier Technology event which takes place in Prague during October. “Integration, Integration, Integration” is still a common cry amongst the DCC community, as the focus to reduce weight continues. With many nations quoting figures in the region of 55-60kg carried by its dismounted users, then the issue is very real, so we all need to do our bit. The Integrated Weapon Sub System (WSS) has been explored by a number of nations as part of their respective Soldier Modernisation Programmes (SMP’s) with varying degrees of success, however the challenge remains with a number of nations / programmes taking a closer look at the potential to integrate centralised power onto individual weapons and provide elements of data connectivity between “modules” - e.g. sights, targeting lasers and other weapon mounted accessories. Sighting Systems need to be easy to use, effective through all weathers and provide the ability to detect targets at the maximum range possible in order to prepare the User for the next course of action. The Urban scenario requires enhance situational awareness, wider fields of view and a rapid target engagement (RTE) process in order to respond within the close quarters. Technology development and connectivity between soldier worn devices will support the evolution of such capabilities. Qioptiq has continued to move forward on the development of Digital Optical Weapon Sights (DOWS), with as number of projects looking at specific aspects including the integration of fire control information and a modular architecture to allow the User to tailor a host sighting system in order to meet his specific mission need. We are digitising the sighting systems of the future. This is very relevant to the future of the DCC Users, and DOWS is the start of that journey. But we realise that one size does not fit all. 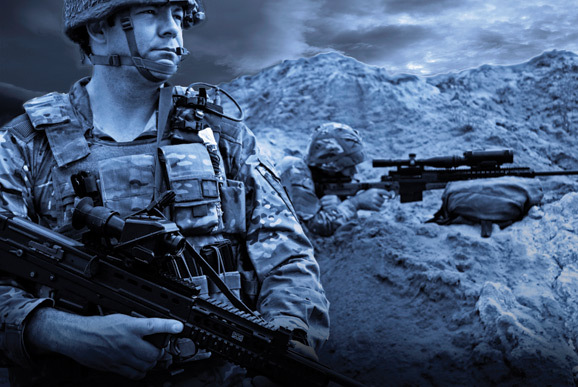 Our work could maximise the performance of rifles, Sharpshooter rifles, heavy machine guns, general purpose machine guns and grenade launchers, especially at night. One of the programme aims is to get them (weapon systems) to their maximum effective range, 24 hours a day, no matter what the conditions. This presents some interesting challenges, particularly with SWaP, so we are looking at how technology and the appropriate use of high definition sensors and image processing algorithms can help. Another area of significant interest is the use of image processing to assist with target detection and identification in order to support the User with early target location and tracking. We can now effectively use sensors to pick out targets and other objects of interest in a scene that the User may not normally see with the naked eye or standard optical sights. Digital Weapon Sights can also offer enhancements due to advances in low power processors (predominantly driven by the smartphone market) and high resolution CMOS sensors, which have the ability to operate at a higher wavelength than the human eye, therefore offering potential low light enhancement. Coupled with high optical / digital magnification capability, enhancing Detect, Recognition, Identify (DRI) capability is a reality, therefore reducing the number of pieces of kit the User needs to carry, which has positive reduction effects to both physical & cognitive burdens. We are continuing to take commercial world capability and consider it for use in the military environment. Human integration factors are key and having the user and stakeholder involved is critical. The art of the possible is immense, but we need to ensure we keep a check on complexity and information overload, as with any other complex integration issue. Augmented Reality (AR) has been demonstrated within military equipment over the last few years. A number of systems have demonstrated the benefit of integrating and displaying target cueing information into support weapon sights to provide enhanced situational awareness and target designation across a networked battlefield. AR provides the potential to improve the capability of the Individual Soldier by providing targeting / navigation information within the weapon sight view, therefore reducing the need for other display devices to be carried & accessed. With worldwide military focus firmly set on cost control and a desire to reduce operational commitments. Modification or technology refresh is a more palatable way of ensuring the warfighter has the tools to conduct his mission and remain technologically one step ahead of his enemy. Due to the recent rounds of defence cut backs and the world’s economic climate, customers are now even more focussed on extending the service life of existing equipment. Getting more from what is already procured and in-service is an attractive option providing a cost effective solution can be provided ; one such cost-efficient way to do this is to upgrade the technology within if you are to avoid capability overmatch. The ruggedisation of COTS technology provides a number of the enablers - COTS (Commercial Off The Shelf) technologies and equipment will begin to become more interesting to those tasked with procurement and support of equipment. Foresight and good planning is necessary to ensure that the new insertions of subsystems are mature and are ready to be inserted at the appropriate time. As Qioptiq continues to move forward with enhanced sighting systems for dismounted users, we are always on the lookout for opportunities to collaborate and partner with industrial players around the world in order to bring world class capabilities to national programmes and to ensure that Qioptiq products remain state of the art and provide features and capabilities called for by the User community. Qioptiq, along with our industry partners are totally committed to reducing the size weight and power burden placed on to our customers – developing the battle winning equipment within the realistic constraints of technology while maintaining affordability. We will continue to develop, push forward and challenge the boundaries to ensure we always stay one step ahead.